The Primavera - Milan-San Remo - the first World Cup race for 1998. This is also the first of the Spring Classics before the peloton heads to the chills of Belgium for the Tour of Flanders and LBL, and to France for Paris-Roubaix. The race began in 1907 with a Frenchman Lucien Petit-Breton taking the flowers. Italian newspaper Gazzetta dello Sport started the race and still sponsors it. The data shows that only 32 riders started in 1907 and Petit-Breton won 300 lire. Starting in Milan, the capital of Northern Italy they ride almost 150 kms south-west to the Tyrrhenian Sea at Ligure. They then head along the sea to San Remo. The race really begins over the last 50 kms as a series of short but sharp hills are encountered. The final hill - the Poggio - is where it usually happens. After they go over the top of this "big gear" hill the race then screams down a 4 kms descent into San Remo and the finish line - after 300 kms. A friend of mine says "they race along the Ligurian Coast and I know a lot of the small towns the peloton pass through. On the way to San Remo they have a lot of greenhouses with carnations in all colours. It's so wonderful!" Milan-San Remo will take its classic route, covering 294 kms. 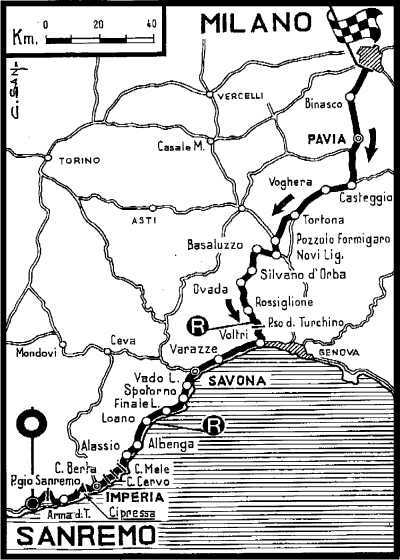 The principal towns on the route are: Milan, Binasco, Pavia, Casteggio, Voghera, Tortona, Pozzolo Formigaro, Novi Ligure, Basaluzzo, Ovada, Rossiglione, Campo Ligure (first feed zone), Passo del Turchino, Voltri, Varazze, Savona, Vado Ligure, Spotorno, Finale Ligure, Loano, Ceriale (second feed zone), Albenga, Alassio, Capo Mele, Capo Cervo, Capo Berta, Imperia, San Lorenzo a Mare, Cipressa, Riva Ligure, Poggio di San Remo, San Remo. Michele Bartoli (Italy). Born 27-5-1970. Major successes: 1996: Tour of Flanders. 1997: Liege-Bastogne-Liege. World Cup - 1996: 3rd. 1997: lst. World ranking: 3. Rolf Sorensen (Denmark). 20-4-1965. Major successes: 1993: Liege-Bastogne-Liege. 1997: Tour of Flanders. World Cup - 1991, 1989: 3rd. 1997: 2nd. World ranking: 21. This will be his 13th Milan-San Remo for the 32-year old Dane. He is in good form having won a stage at Tirreno-Adriatico where he beat Zabel on a slight climb. He's a tough rider. Be also on the lookout for his compatriot Lars Michaelsen (TVM). Johan Museeuw (Belgium). 13-10-1965. Major successes: 1993: Tour of Flanders. Paris-Tours. 1994: Amstel Gold. 1995: Tour of Flanders. GP Suisse. 1996: World road race championship. Paris-Roubaix. World Cup - 1993, 1994: 2nd. 1995, 1996: 1st. World ranking: 12. The 32-year old Belgian always target the classics and the World Cup and he has announced that he does not want to ride the Tour de France this year. He leads a very strong team, Mapei-Bricobì, where Franco Ballerini also has ambitions. Laurent Jalabert (France). 30-11-1968. Major successes: 1995: Tour of Spain. Milan-San Remo. 1997: Tour of Lombardy. Paris-Nice. World Cup - 1991: 2nd. World ranking: 1. 29-year old Jalabert is number one in the World Rankings and he won Milan-San Remo in 1995, ahead of Fondriest. This season he has won at the Tour du Haut Var and finished second at Paris-Nice behind a super Vandenbroucke, where he was slowed down a bit by a dose of the flu. Jalabert grows when the going gets tough - like at San Remo. Andrei Tchmil (Belgium). 22-1-1963. Major successes: 1994: Paris-Roubaix. 1997: Paris-Tours. World Cup - 1994: 3rd. 1995: 2nd. World ranking: 4. Tchmil (35) has been Russian, Ukranian, Moldavian now is a nationalized Belgian. He figures in a lot of the predictions. Winner of Paris-Roubaix in 1994, the Lotto rider is always in the first row in the classifications. Tchmil has shown at Paris-Nice a little of his capacity - in the climbs and especially in the sprints, where he even had the measure of Tom Steels. Andrea Ferrigato (Italy). 1-9-1969. Major successes: 1996: Leeds Classic. G.P. Suisse. World Cup - 1996: 2nd. World ranking: 46. Mauro Gianetti (Switzerland). 16-3-1964. Major successes: 1995: Liege-Bastogne-Liege. Amstel Gold. 1996: Japan Cup. World Cup - 1995: 3rd. World ranking: 40. Andrea Tafi (Italy). 7-5-1966. Major successes: 1996: Tour of Lombardy. 1997: Rochester Classic. World Cup - 1997: 3rd. World ranking: 7. Davide Rebellin (Italy). 9-8-1971. Major successes: 1997: San Sebastian Classic. GP Suisse. World Cup - 1997: 4th. World ranking: 16. Max Sciandri (Britain). 15-2-1967. Major successes: 1995: Leeds Classic. World Cup - 1993: 3rd. World ranking: 50. Fabrizio Guidi is a 25-year old from Pisa. He is riding for Team Polti this season. After a brilliant 1996, with 16 victories, 1997 was plagued by physical problems. He showed excellent form during Paris-Nice and on the toughest stages he always was with the best. His team also counts on Mirko Celestino, Axel Merckx and Silvio Martinello. Gabriele Colombo is a 25-year old riding for Ballan this season. He exploded in 1996 with his win at Milano-San Remo and remains the last Italian winner of the classic. After a forgetful 1997, he seems to have returned to good form at Tirreno-Adriatico where he won the Tivoli stage with an attack on the climb in the last kilometer. Marco Pantani is 27 and rides with Mercatone Uno-Bianchi and is one of the best climbers of the peloton. In 1997 he won two stage at the Tour. This year he's already had success at a mountain top finish stage at la Vuelta a Murcia. He has been training hard to be in good form for tomorrow. He is dangerous because he's unpredictable. His team also has Konyshev and Traversoni. Mario Cipollini at 30 years old is the number one sprinter in the peloton. He rides for Saeco-Cannondale and has won already this year at the GP Costa degli Etruschi and a stage at the Tour of the Mediterranean. Milano-San Remo has always been his forbidden fruit - he finished second in 1994. He has been training hard at home, sometimes with Bartoli, after his exclusion from Tirreno-Adriatico because of the protest of the 125 at Baia Domizia. Erik Zabel is 27-years old and hails from Berlin. He has ridden for German team Telekom-ADR for several seasons. He won the sprint for San Remo in 1997, which was the first sprint finish in 17 years. He has shown at Tirreno-Adriatico that he's the favorite for tomorrow. He has already five victories this season and has imporessed everyone with his performance on the climbs. It will be difficult to get rid of him at la Cipressa and il Poggio. Nicola Minali is 28 and rides for Riso Scotti-Aiwa. This year he has won a stage at Tour Mediterranean and at the Giro della Provincia di Siracusa. Recently, he has been training at home after his exclusion from Tirreno-Adriatico. Together with Cipollini and other sprinters like Steels, Leoni, Balducci, Traversoni, Van Petegem, they hope for a sprint finish like last year. Rolf Jaermann is 32-years old and could be the big surprise at Milano-San Remo this year. He has most recently won at Tirreno-Adriatico with authority and he counts on a team, Casino, which is going through an incredible period - 13 victories with 8 riders and 2100 UCI points accumulated since the start of February. Massi, Elli and Richard complete the team for tomorrow. Gianluca Bortolami is 29 and from Milan. He rides for Festina. Winner of the World Cup in 1994, this season he has won at the Giro di Chiasso open. At Tirreno-Adriatico, he suffered from the flu. The other hopefuls for Festina will be Zülle, Virenque and Dufaux. Francesco Casagrande is 27-years old and he has left Italy this season and is riding for French Team Cofidis. He has trained hard over the Winter to be competitive in the early classics. He conquered the tough Mont Faron stage at the Tour Mediterranean and was up the top of the classification for the Vuelta a Murcia. There will be 200 riders from 25 teams. Eleven Italian teams, five French, four Spanish, two Dutch, one German, Belgian and American.